Bob Hawke is happy, come to think of it, I have never seen him not happy. He is walking down Lygon Street, across the road from the Trades Hall Building, and is greeting everyone he meets with the same wide grin and a friendliness which precedes him. Even to my very young eyes, I recognise him as a person of charisma and power. Today he is visiting his barber, a middle-aged Italian man who has been cutting Bob Hawke's hair for years, and whose bursting pride is behind a collage of photographs of Bob Hawke and others he has stuck on his wall. Looking through the window and into this small shop it seems crowded, but mainly with good cheer, personality and colour. Norm Gallagher's office is in the building next door. It is in a modest 60's style building, through a glass door, up a flight of stone stairs and to the left. His view could have been out onto Lygon Street and the Trades Hall Building across the road, but he has chosen instead to sit behind a desk facing in, his back to it all. He sits crouched over his desk, overweight; his black rimmed glasses the colour of his hair. He looks up as I come to the door. This is a man who wields considerable power and who the press often carry stories about as the Secretary of the Builder's Labourers' Federation (BLF). But just recently he hasn't been out of the headlines. The workers love him, the governments and industry are crying foul and want him gone. And in between there is a war of words going on that we’re reading about in the papers. Jack Mundey, the BLF Secretary in NSW and hero to many, including environmentalists, has been sidelined now. Jack Mundey had galvanised the force of the BLF in NSW to help save the last bit of undeveloped bushland in Sydney's inner west. He had also saved the Rocks, Victoria Street in Potts Point when the residents there were being harassed by developers, Centennial Park and the Sydney Botanic Gardens. But the BLF has been preserving landmarks in Victoria and elsewhere too; Royal Parade in Parkville has come under their protection, along with buildings which include the Regent Theatre, sitting as a beautiful shell in its derelict state for years. And here is the man largely responsible. A man who, without advantage, had begun working when he was 13, joined the BLF at 20 and worked his way up to head the BLF Victorian Division by the time he was 39. 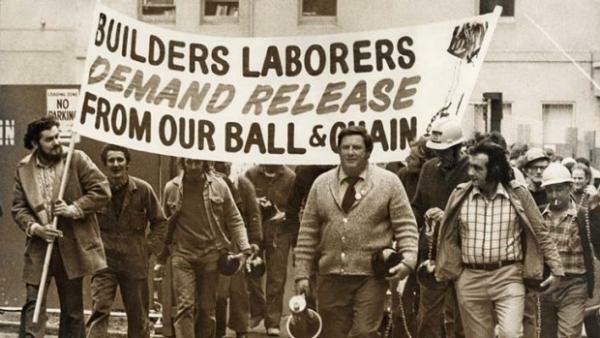 As Federal Secretary he had brought together a forward-seeing, capable group of people which included Jack Mundey, John Cummins, Joe Owens, Kevin Reynolds and Steve Black among others, to continue to improve the working conditions and the lives of the thousands of people on building sites; as well as supporting people outside the industry by rallying to their cause, which included supporting the rights of Aboriginals and women. He is without a doubt one the most controversial champions of the people in the modern era. But if I were to close my eyes now and ask him to say, "Be very, very quiet, I'm hunting rabbits", it would be the image of Elma Fudd I'd see; Be ve-wy, ve-wy qwiet, I'm hunting wabbits, Norm Gallagher would respond, as is his normal way of speaking. Instead I ask him to sign the letters I am holding in my hand.